For the last 6 days we have been publishing all the different tactical priorities within the different mentality structures and fluidity settings from very fluid to balanced and very rigid, which we published yesterday. Now it’s time to change the focus to understanding how the mentality ladder influence all parts of play; the different phases where the player has the ball to defending and pressing. This section is one of the most in-depth and massive as it features so much! What’s certain is that this part is one of the most important articles to fully understand the mentality ladder in practice. 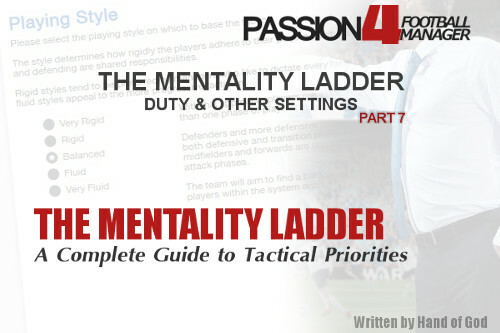 Part 7 of the mentality ladder, duty and other settings gives you a chance to understand the tactical priorities in attacking counter attacking and defensive part of play, to name some few. 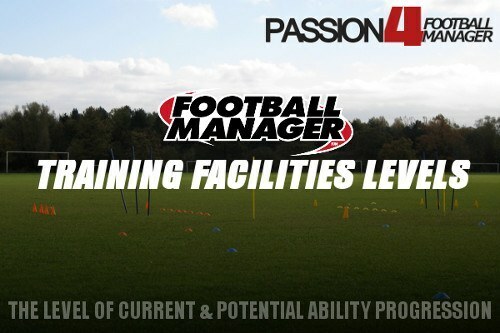 As you will learn the specific assignment of player duties in mentality structures will greatly affect how the team’s shape develops in attack. When play advances deep into the opposition half, there is a chance that these players will briefly take up support or, on rare occasions, attack duty responsibilities when it is both safe and opportune to do so. This possibility is represented by the “Join Attack” task at the top of the Defend duty mentality ladder. “Join Attack,” essentially, represents all the various support and attack duty attacking responsibilities. As such, it is not actually available as a tactical priority (as a player with such a priority would then cease to be a Defend duty player), and given Defend duty players’ general hesitancy to move up the mentality ladder during the attacking phase, the responsibility is typically only taken up by players who have very aggressive tactical priorities. Support duty players will move up and down the ladder as necessary to prevent the attack from becoming too isolated. As the attacking phase begins, support duty players will attempt to quickly move into an area where they can receive the ball and focus on their tactical priority. From there, they will either look to circulate possession among nearby players or, depending on the risk involved and the player’s tactical instructions, play the ball forward to an advancing teammate. As attack duty players and more advanced support duty players push the opposition defence deeper, a support duty player will readily move up behind them to prevent the attack from becoming isolated. When play advances deep into the opposition half, there is a chance that these players will briefly take up attack duty responsibilities when it is both safe and opportune to do so. This possibility is represented by the “Surge Into Box” task at the top of the Support duty and playmaker mentality ladder. As with “Join Attack,” “Surge Into Box” represents all the various attack duty attacking responsibilities, and as noted above, this means it is not actually available as a tactical priority. However, given support duty players’ greater tendency to move up the ladder compared to defend duty players, most such players with attacking or control-oriented tactical priorities will typically attempt forward runs periodically throughout the match, though as with defend duty players, it is contingent on the availability of defensive cover and teammates willing to take up their current attacking responsibilities. Whereas other players will tend to focus more heavily on their specified tactical priority in the attacking phase and be more hesitant to move forward once their main responsibilities have been securely carried out, attack duty players will rapidly climb the mentality ladder as soon as supporting teammates are available to help take up the attack duty player’s main responsibility. In this sense, attack duty players view themselves as the vanguard of the team’s progression, and while they may stay deep to help carry out a defensive or control-oriented responsibility, they will only look to initiate the task in question before pushing forward to create room for teammates to advance. Thus, just as support duty players with attack-oriented tactical priorities have a greater tendency to get forward themselves, attack duty players with control or defend-oriented tactical priorities will have a greater tendency to wait to receive the ball ahead of the defensive line and look for support before taking on the defence. However, unlike defend and support duty players, attack duty players will readily advance deep into the attacking third with minimal regard for the amount of defensive cover available. In this sense, when it comes to attack duty players, it is the manager’s responsibility to ensure the structure is in place to ensure they get forward without compromising the team’s ability to defend against counterattacks. The specific assignment of duties in a mentality structure will greatly affect how the team’s shape develops in attack. In most situations, it’s wise to keep a balanced arrangement of duties to ensure no one part of the team finds itself isolated and overwhelmed, and if circumstances demand a reorientation of the team’s tactical priorities, altering the team mentality setting (and thus, mentality structure) is the most balanced and prudent option. Traditionally, the general recommendation has been that these spare duties should be assigned in accordance with the team’s mentality setting with more defensive team mentalities having more defend duties, more control-oriented team mentalities having more support duties and more attack-oriented team mentalities having more attack duties. However, there may be circumstances where simply assigning more of one type of duty may prove a better option for refocusing the team’s attacking shape to serve a highly specific objective. This should only be done with careful consideration of what you’re trying to achieve, and unbalanced mentality structures should never be indiscriminately taken into every match with no regard for the opposition. Unbalanced structures inherently lack versatility (this is what makes them unbalanced), and they all contain glaring weaknesses that will be readily exploited by most opponents. In terms of the mentality ladder, assigning more defend duties will lead to significantly less deviation from the mentality structure as much of the team’s defensive shape will remain intact during the attacking phase. Predictably, this will reduce the risk of counter attacks, but it will also severely blunt the team’s attacking momentum and make it difficult for the team to advance the ball up the pitch. Assigning more attack duties will cause the team’s shape to deviate dramatically from the mentality structure during the attacking phase (and keep in mind, this doesn’t just apply to the player with the attack duty as any drastic movement on the mentality ladder from any one player will have a domino effect on the rest of the team). This will create more options for successfully playing the ball deep into the attacking third, but it will greatly increase the risk of counter attacks and leave less players looking for the best option to play the ball forward as the creative burden of linking the attack is shifted onto a smaller group of players. Visualizing exactly how your formation transforms into its attacking shape is one of the more challenging aspects of designing a tactic, and in fact, there is no simple way to do this. Much will depend on how your attack shapes around the structure and quality of the opposition’s defence, but duty can give you an imperfect sense of how to translate your attacking shape into the nomenclature of formation. In general, attack duties will add more numbers to the striker and attacking midfield strata, support duties will add more numbers to the central midfield stratum and defend duties will add more numbers to the defensive midfield and defender strata. Again, this is a highly imperfect method, but if you’re having trouble sorting out how a mentality structure will operate, it may prove helpful. When attacking play breaks down and your players are forced to play the ball back to keep possession, all players will begin to move back down the ladder with defend and support duty players being more inclined to quickly gravitate back towards their tactical priority. Usually, only players with the most attack-oriented tactical priorities will simply drift around looking for space in the box while possession is being recycled, and of course, even they will drop deeper if play is pulled back deep enough to allow the opposition’s defensive line to push up. In general, when off the ball with a teammate in possession well inside the opposition’s half, attack duty players with tactical priorities that call for them to be beyond the current position of the opposition’s defensive line will either sit on the shoulder of the last defender or drift into available space ahead of the defence. For centrebacks, your defensive line instructions will also have an effect. For the most part, centrebacks will be highly reluctant to deviate from a position that enables them to maintain a focus on their tactical priority. Therefore, your most cautious centreback’s tactical priority will give you a good sense of where your default defensive line will be positioned while your defensive line instruction will control how far they deviate from this position. A lower defensive line will strictly limit how high your centrebacks will climb up the ladder whereas a higher defensive line will allow them to climb higher than normal, though even on the most aggressive settings, centrebacks generally won’t position themselves to do much more than suppress counterattacks. Accordingly, the defensive line instruction has less significance for centrebacks with more aggressive tactical priorities as there is less “space” between the upper limit to which they may push up and the tactical priority towards which they are inclined to drop. However, it’s important to keep in mind that your mentality structure mainly determines how and where your players will first attempt to win the ball, but as the opposition’s attacking play progresses into your half, your team will respond by climbing down the mentality ladder accordingly. For players with a more attacking mentality, their tactical priority will determine how soon they’ll stop waiting to break forward and start tracking back to defend with the rest of the team. It’s important to note that this means players with aggressive tactical priorities won’t be in any hurry to track back into the defensive third. With certain style and mentality combinations, this means your strikers and attacking midfielders will generally stay forward with the intention of initiating counterattacks from recovered clearances or intercepted back passes. Additionally, strikers and attacking midfielders aren’t going to be inclined to help central and defensive midfielders cover space behind the ball, so using an abundance of attacking players will naturally increase the likelihood that your defensive shape will contain glaring gaps for the opposition to exploit. While the pace and directness with which attacking play develops is determined by several different settings and instructions, a player’s tactical priority largely determines the amount of risk they’re willing to take to either create a chance or just simply move the ball into a more advanced position. For the most part, a player with a more aggressive tactical priority will take more risks to impose offensive pressure on the opposition and play through defensive pressure imposed by the opposition in order to ensure play advances to an area of the pitch where he will be able to carry out his priority’s associated task. Again, though numerous team and personal instructions can affect the details of a player’s decision-making, a player’s tactical priority will give you a very general indication of how they’ll behave at various points along the mentality ladder. Defensive-oriented players will mainly focus on keeping the ball well clear of the defensive third and minimizing the risk of being hit on the break. Control-oriented players will mainly focus on keeping the ball circulating through a certain area of the pitch until they see a clear opportunity to play it forward (assuming, of course, this opportunity conforms with their tactical instructions or, failing that, personal tendencies as a player). Attack-oriented players will show significantly less regard for maintaining possession as they focus on simply moving the ball up the pitch and into the attacking third (again, in accordance with their other tactical instructions and personal playing tendencies) . This relationship is largely what makes a particular task or responsibility that player’s priority. While I have so far emphasized that mentality structures are dynamic with players shifting up and down the ladder to take up different tasks when appropriate, this does not mean a player simply loses sight of what he’s primarily supposed to do when circumstance demands that he does something else. Players with different tactical priorities will play differently even if they happen to be on the same rung of the mentality ladder. Again, in the most practical terms, a player’s tactical priority reflects the degree of risk they’re willing to take to perform any given action on the pitch. This includes getting forward, passing, dribbling, shooting, tackling, basic positioning and basically every conscious act that a footballer might perform. The attacking priorities in the upper third of the ladder will, thus, lead a player to take more risks to move the ball up the pitch, create chances and promptly regain possession. The control priorities in the middle third of the ladder will lead a player to try to balance risks in various aspects of play. In general, this will lead him to emphasize maintaining possession, as he will neither be too wasteful with his passing in the opposition half nor too hasty to clear the ball from danger in his own. The defensive priorities in the lower third of the ladder will lead a player to limit risk with a greater emphasis on simply preventing opposition chances and holding onto the ball when not under pressure. Role mainly functions by increasing a player’s preference for performing certain actions over others, so in terms of tactical priority, it can be thought of as modifying the acceptable level of risk that a player is willing to take to perform a specific action (e.g., dribbling, passing, tackling, shooting from distance, etc.). Of course, no setting will make a player a mere robot. Players will deviate from their role’s instruction if the action in question appears to have the highest potential benefit and the risk is low enough. However, as risk naturally escalates with a phase of play culminating in an attacking move, the collective effects of tactical priority and role will become more pronounced. The basic level of risk-taking established by a player’s tactical priority is further modified by a player’s expressiveness. A player’s level of expressiveness is controlled both by their flair attribute and tactical instructions. A higher degree of expressiveness will raise the maximum risk a player is willing to accept to perform specific types of actions when in possession. In effect, it will primarily make the player more likely to attempt ambitious, higher risk actions to achieve greater benefits in attacking play. A team’s fluidity setting has a significant influence on the expressiveness of players. More fluid settings will encourage players to be more expressive while more rigid settings will encourage players to be less expressive. Thus, in more fluid settings, players will generally be more ambitious in how they choose to carry out their tactical priority and will deviate more readily from the confines of their role (especially if the role imposes numerous restrictions on how the player plays), whereas players in more rigid settings will be more disciplined and methodical in how they choose to carry out their tactical priority with less deviation from any restrictions imposed by their role. Aggression can be thought of as the defensive counterpart of flair. While flair modifies a player’s tendency to attempt more ambitious actions in possession, aggression will increase a player’s tendency to take risks when out of possession. Specifically, a highly aggressive player will look to get directly involved in defensive play at every opportunity with a greater willingness to get stuck in and risk fouls. On the other hand, a more passive player will tend to sit back and help the team maintain its shape while waiting for clear cut opportunities to dispossess opposition attackers. However, while fluidity is largely a managerial concept that serves as an abstract and somewhat esoteric representation of a set of more mundane instructions, roaming is a much more simple footballing concept that applies to an individual player. In short, the roaming instruction gives a player more freedom to break from the team’s basic shape to open up play or provide positional support for a teammate. To a great extent, this will cause a player’s lateral movement to be much more dynamic, though in terms of the mentality ladder, roaming can be thought of as also making a player’s movement up and down the ladder much more eratic and unpredictable in relation to the rest of the team and, by extension, the mentality structure. Thus, a roaming player will be much more likely to take up responsibilities well outside the basic organizational framework specified by the team’s mentality, fluidity and duty settings. As you may have noticed in the prior sections, more fluid settings do not necessarily equate to a greater gap between the tactical priority of forwards and the tactical priority of the deepest defender, only the number and degree of the distinctions in tactical priority between various roles and positions. While fluidity will affect how “vertically” expansive or compact your team’s shape will be at various points in attacking and defensive play, both sides of the continuum give you options. In fact, the fluid and rigid settings are actually mirror images of one another with “Very Rigid” and “Very Fluid” resulting in a generally more compact shape while “Rigid” and “Fluid” result in a generally more expansive shape (“Balanced,” on the other hand, offers more flexibility). But again, fluidity merely modifies other tactical settings at the most abstract level. In terms of defining the team’s shape for the various phases of play, fluidity is only one component along with formation, duty assignment, role, etc. Fluidity, in this sense, is not a question of whether a team coheres as a single, cooperative unit during a given phase of play. Fluidity simply determines how many different tasks the team will usually be focused on carrying out at any given moment, or in terms of the mentality ladder, it determines how many positions or rungs the players occupy at any given moment. A more fluid system will usually have the team focused on less tasks as a whole with more players focused on carrying out a specific task. A more rigid system will have the team as a whole focused on more tasks with less players focused on carrying out a specific task. In both cases, the team will be structured around a group of core tasks of a certain type (i.e., defensive, controlling, attacking as defined by the team’s mentality setting), but more rigid teams will typically have a greater degree of stratification between different positions and roles. Accordingly, fluid systems are associated with generalism (also referred to as universalism), the idea that players should be more versatile and intuitive in their play while cooperating closely to carry out specific tasks. The greater number of players focused on or closely supporting specific tasks means the team has more options available for successfully carrying out each task. However, it also means the team may progress up the ladder in a slower, more disorganized fashion while the players themselves are more likely to be called upon to carry out a broader range of tactical responsibilities during a single phase of play. This is why it’s recommended that managers who prefer a more fluid system make more use of the more generic roles that are designed to carry out multiple tasks. In contrast, rigid systems are associated with specialism, the idea that players should focus on a more refined set of skills and tactical instructions to optimize their ability to carry out specific tasks. The smaller number of players focused on or closely supporting specific tasks means the team can typically progress up the ladder in a faster, more efficient manner with players less likely to deviate too far from their tactical comfort zone, but reversing the benefits and drawbacks of a fluid system, it also means the team has fewer immediately options available for successfully carrying out each task and can become disjointed if one link in the chain is effectively targeted by the opposition or just simply under-performs. And this is why it’s recommended that managers who prefer a more rigid system make more use of the specialist roles that are designed to optimize their ability to individually carry out specific tasks. In this sense, rigid structures promote a system-oriented approach to the game. Players adhere to a more restrictive style of play with the assumption being that the aggregate effect of adhering to a more coherent plan will ultimately prove more beneficial than the aggregate effect of simply letting players follow their intuitions on a moment-by-moment basis. In other words, the rigid, system-oriented approach asserts that the whole is greater than its parts with the best possible sequence of play not always resulting from the “best” option in an individual moment of play. The counter attack phase effectively overrides your mentality structure by causing all players to assume the highest position on their respective mentality ladders and temporarily focus on overloading the opposition defence. All players will immediately begin climbing the mentality ladder with an extreme level of urgency, and only defend duty players will hold off from attacking the opposition’s third (though even they will be to do so if there are sufficient number of teammates behind them). This temporary alteration of the mentality structure will continue until the opposition regains possession or gets an adequate number of players back between the ball and goal. On a Standard, Control and Attack mentality, counter attacks are less likely to occur after winning the ball in a deep position. Since these mentalities already encourage relatively quick build-up play, the players will be more inclined to carry out a more elaborate build-up at a faster pace, though the counter attack phase will still be initiated if the opposition has left its defence badly exposed. Additionally, since you will typically go up against more cautious opponents when using these mentalities, it ensures your side won’t simply bomb forward directly into an entrenched, well organized defence when a more considered approach is necessary. On these more aggressive mentalities, the counter attack phase will be more likely occur when an attacker manages to win the ball in an advanced position or if you happen to be playing an open game against another aggressive opponent. As such, if you want to facilitate more quick breaks on these settings, you will need to ensure you have attackers pressing the opposition’s deep-lying midfielders and defenders. Closing down settings function by modifying a player’s willingness to break from the defensive shape to press an opponent on the ball. For the most part, it determines how quickly and how far a player is willing to venture forward to close down the opposition, but as with other settings, this is relative to the risk and reward involved. A player’s tactical priority will give you a good sense of the default point in the defensive phase at which a player will start pressing the opposition as well as the manner in which they go about closing down the opponent (e.g., promptly diving into a tackle or methodically restricting space from a comfortable distance… or any degree in between). Accordingly, there is no fixed location on the pitch which will always prompt a player to immediately close down the opposition. There are always limits to how far a player will venture from their defensive position, even if they have an aggressive tactical priority and are assigned to press higher. Generally, a player won’t venture too far beyond the zone defined by the team’s defensive shape unless there is both sufficient positional cover behind him and a sizable, undefended gap between himself and the player with the ball. In previous versions, passing risk was controlled by the “through balls” instruction, but this name often created the misconception that it only referred to attempts to play the ball behind the defensive line. Now, this instruction is referred to as the more appropriately general “risky passing.” Telling a player to attempt riskier passing increases their tendency to attempt passes behind or between defenders with the intent of getting the intended recipient beyond his marker. Thus, less risky passing will encourage players on the ball to wait for options to drop back and make themselves available for a pass while more risky passing will encourage players to play the ball through gaps in the defence (though not necessarily beyond the defence as a whole). “Exploit the Flanks” will increase the tactical priority of your fullbacks or wingbacks while effectively giving them all an attack duty. While the alteration of tactical priority is variable depending on your team mentality, the idea is that it will essentially encourage your fullbacks or wingbacks to operate more like wide midfielders. “Exploit the Middle” will give a more aggressive duty to all central players other than keepers, sweepers and centrebacks while giving a more cautious duty to all wide players. Thus, defend duty central players take up a support duty, support duty central players take up an attack duty, attack duty wide players take up a support duty, and support duty wide players take up a defend duty. “Look for Overlap” works much like “Exploit the Flanks” with the added effect of wingers and wide forwards being given a more cautious duty to cover for the more aggressive fullbacks and wingbacks. “Take a Breather” effectively instructs everyone to drop down to a more cautious duty (i.e., attack duty players become support duty players while support duty players become defend duty players). In practical terms, this encourages your team to just sit back and avoid moving play into the attacking third.